The Human Table Football is a popular and hilarious game where you and your stags are attached by Velcro onto huge plastic poles that slide from side to side to give your stag party that bizarre and unique time you may be looking for. It is not just a case of sticking you onto the pole and away you go! There are rules and regulations and referees are on hand to make sure these are all adhered to, otherwise you may find yourself being given the red card and sent off! Ranging from five to eight-a-side, this fun game can be played indoors or outdoors and can last from a few hours to a complete weekend package in the UK or abroad in the sun. Instead of a wooden table with two people on either side guiding the sticks of glued on little men in sporting outfits; you and your stags will find yourself in a giant fifty foot by twenty five foot inflatable version of the classic table football game competing against another team. Once you have been strapped in by the Velcro to the bar you can only move left and right with a tiny movement forwards and backwards and different variations of the game are available. Each player will be given a chance to score a goal but beware, if you kick the ball outside the guidelines you will have to un-strap yourself and go fetch the ball! For those stags that are not able to play the game, don't worry as watching it can be just as much fun as playing and you can help spur on your team by giving encouraging shouting tactics from the sideline. After having spent a surreal afternoon with side splitting laughs and maybe a bruised knee and/or a bruised ego, you can all carry on to the evening stag party. For those that want to carry on and make your stag party a night or two to really remember, there are places in the sun that will cater for you. A four course lunch of either a traditionally Spanish meal or a BBQ during summer season. Playing the game for as long as you want, or however long you can last for. Transfers to and from your accommodation to the football site. Unlimited supplies of beer, wine, soft drinks (some only during meals). Do your research and get quotes from different companies to see what their best deals are. Ensure that your stags are medically fit enough to participate in the game. 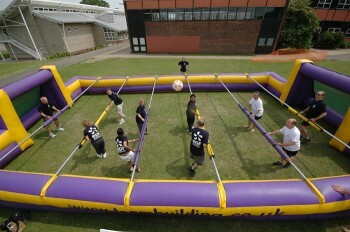 Find out if coach trips offer in their price travel and accommodation as well as the human table football game. Find out if it would be cheaper to hire a mini bus and self drive you and your stags abroad. Go during out of season which should be cheaper. Everybody wants to believe it was their country that invented something and like most stories of where they came from the table football game is no different in as much as the English believe they were the first to invent the table top game. Harold Thornton in 1922 laid matches across a box and formed the basis of the game of replicated football that could be played in the home. When his uncle, Louis P. Thornton visited him from Portland, Oregon he took the idea back with him to America and patented it in 1927. But going back much further to a time period of 1880 to 1890, it is said that the game was invented by Spanish born Lucien Rosengart who as a child was injured during the Spanish Civil War. Unable to play with the other children he came up with the idea of football being played without feet. It is said that he patented the game but lost the papers in a storm when he was fleeing from his country to France. Whoever invented this fun football game has given many over the years great delight in playing it and 'coaching' their own football team. You and your stags can become a huge team and feel like you have stepped into the film set of 'Honey I Shrunk the Kids' and have that fun filled stag night that will be remembered for a long time to come!